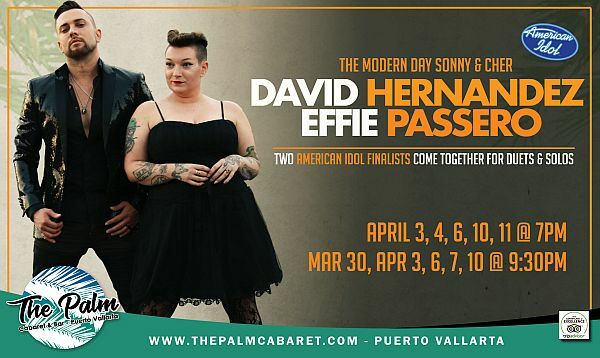 Puerto Vallarta, Mexico - The 2018/19 season has turned out to be amazing for The Palm Cabaret & Bar. So many new acts graced our stage, and so many new faces joined our audiences, we could not be happier! If you have seen and enjoyed some of our shows recently, please give us a like on TripAdvisor, as every little bit of positive feedback helps. We are already preparing some new and exciting entertainment for our reopening in November, but we still have two more nights to go this season, so make plans now to come out and see what we have in store for you on April 10 and 11. Miss Conception has done it again with a series of sold-out shows. The costume-reveal Diva has the town talking, and everyone agrees. Kevin Levesque has mastered the art of quick change and his live vocals are impressive, adding side-splitting comedy to weave it all together. Yes, there is audience participation, which adds to an experience you won't soon forget. When this article is published, you will only have ONE MORE CHANCE to see 'Miss Conception's TV Land' - on Thursday, April 11 at 9:30 pm - and tickets are selling fast. You don't want to miss this one, because once it's done, it's gone. American Idol sweethearts have joined the Palm Cabaret family this year, and we could not be happier. David Hernandez (American Idol season 7) and Effie Passero (American Idol season 16) are so good together, its amazing that this collaboration did not happen sooner. Both perform together to deliver solid duets but also perform solos, where each artist highlight popular music, and their own original works. Effie, who is currently writing a musical, debuts an opening number "Simply Happy" that is worthy of any Broadway Stage, and David delivers his Billboard chart-topper "Beautiful." We are so grateful to have these two incredible artists on our stage, and you still have THREE MORE CHANCES to see this modern day Sonny & Cher at The Palm Cabaret - on April 10 at 7:00 & 9:30 pm, and on April 11 at 7:00 pm. There have been many changes to The Palm Cabaret and Bar this year. There have been upgrades to the venue, new marketing strategies, new staff, and incredible new performers. We are proud of everyone that has graced our stage and worked in our theatre. The Palm wishes to thank everyone who is and was employed and had volunteered this season, we could not have done it without you. We also want to thank our audiences. You are the reason we are here and we will continue to introduce this town to great and diverse entertainment. And finally, we would like to thank this town. Puerto Vallarta really is the best place to live, and to visit. As the town grows, so will we. In fact, we are already preparing some new and exciting events for our reopening in November. Here's to a bright new season on the horizon, and an amazing future for us all. The Palm Cabaret and Bar is located at 508 Olas Altas in the heart of the Puerto Vallarta Romantic Zone. Tickets to all shows can be purchased at the venue's box office, which opens daily at 10 am, or online at ThePalmCabaret.com.